Hello everyone! Hope you're all doing well. This has been a crazy week for me - next week is the last week of classes before spring break so I've had a lot of work to do. In the midst of all my work and activites though, I find it increasingly important to take some time for relaxation. I've always heard the saying that you can't have good grades, enough of sleep, as well as a social life when you're in school. While some days I think this is true, I do my best to convince myself otherwise. Sometimes I get so caught up in my work that I forget to take a break. In these times I have to remember that stopping for even five minutes might help me to feel refreshed and be much more productive when I return to my work. If I'm being honest, I didn't participate in a crazy amount of extra-curricular activites when I was in high school because I was afraid that if I did, I wouldn't have time to get my homework done. I consider myself a slow reader (although I've definitely gotten faster since the beginning of college! ), so I like to allow myself a significant amount of time when I know I have a lot of reading to do. However in college, my schedule is quite different. When I came to SMC, everyone told me the best way to meet new people and make long-lasting friendships was to be involved, so that's what I tried to do. As a result of participating in many different activites, I have to carefully plan my days to make sure I give myself enough time for my school work. Especially during busy weeks like this one, going to the library works really well for me becuase it provides an environment where I can really focus on being efficient in getting things done with minimal distractions. Some days, however, I choose to work in my room instead. As you may know, I have an awesome roommate and we live next door to two of our best friends. You can probably guess that if we're all home at the same time, it's really tempting to hang out rather than work. However, I have come to realize that even if I get my work done, I don't feel as good about everything unless I spend some time with my friends each day. With the exception of meals, the time I spend with my friends is often unplanned, which makes it all the more special. For example, last night I got home around 9:30 with the intention of showering, working, and going straight to bed. But it just so happened that a few of my friends were hanging out together so I went to say hi and ended up spending half an hour with them and going to bed later than I had originally planned. Even though I didn't get as much sleep as I would've liked, I woke up in a fantastic mood because I had allowed myself to spend some quality time with my friends (for the record, I did get the work done that I needed to!). Especially in the past week, I feel like I have put a special focus on maintaining my mental health by spending time with friends during the week (rather than just on the weekends). This has happened sporadically as well as by simply texting some of my friends to see if they want to grab a meal together. Each time I see my friends, I am reminded of how much I love them and how lucky I am to be at a wonderful place like SMC, surrounded by such great people. Speaking of great people, I would like to give a special shoutout to my fellow blogger and amazing friend Alex. In addition to cooking a meal for me, she has listened to me rant about various stressors in my life (classes, activites, etc.) a lot this past week. 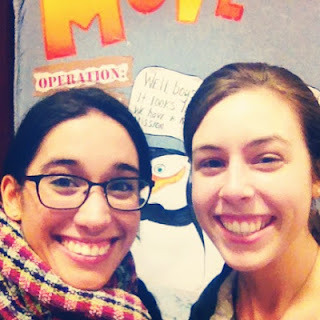 I read her blog religiously before coming to Saint Mike's and never imagined that we would become such great friends. She is like the sister I never had and I'm so thankful for all the advice she's given me, whether it be about friendship or how things like class registration work at SMC. It is quite possible that I think mental health is so important because I'm a psych major, but whatever the reason, it's so important to surround yourself with wonderful friends and make time to show them how much you appreciate them. I have been working on this a lot lately. I like to say that my new motto is "It's all about that mental health!" because that's truly what I believe. Alright, I think that's all I have to say about that! I have a busy weekend ahead (full of activities to boost my mental health :)) which I will be sure to update you on soon! As always, thanks for reading my blog!! PS Shoutout to everyone in my wonderful SMC family, especially those who have helped to make this past week awesome!